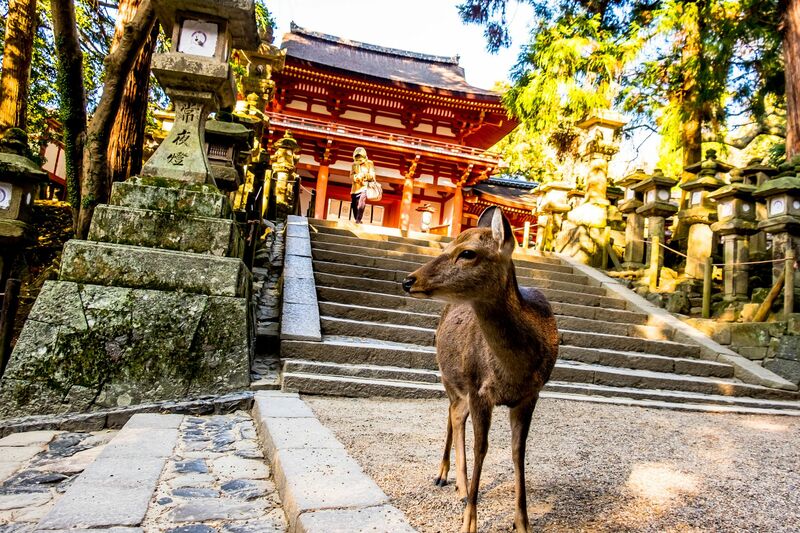 If you are ever in this part of Japan, you will have to do a day visit to the lovely city of Nara. Unlike some other historic sites in Japan which can be found at the fringes of modern city landscapes, there is a very special "lost in centuries past" feeling which sorts of engulfs you moments after stepping out of Nara's central Kintetsu-Nara train Station. Nara was, for a short period of time, the capital of Japan in the 900's. Today, eight ancient temples/shrines in the area collectively remain as a UNESCO World Heritage Site. While Nara is a city with a population of just over 350,000 people, Nara as a whole feels more like a quaint old town, reminiscent of the outskirts of ancient Japan. 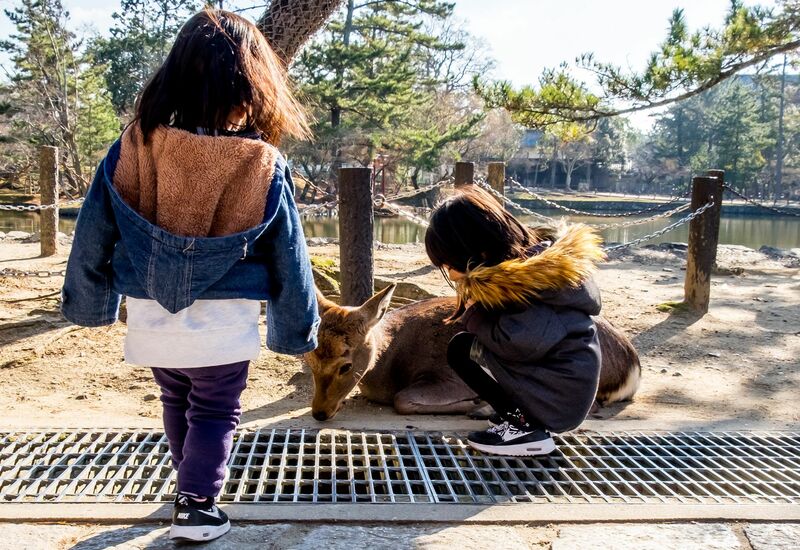 A short stroll from the train station takes you to Nara Park, the center of what might be largest free roaming group of wild deer in any civilized city today. These deer are friendly and freely mingle with anyone coming their way. They are especially friendly towards anyone holding out deer crackers (bought from nearby stalls/vendors)! This is a great place to bring the kids. 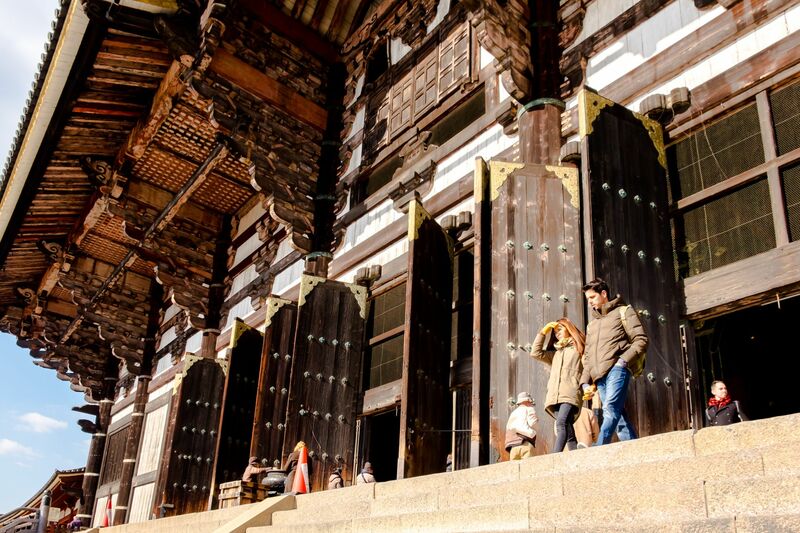 A path leads you towards the imposing Nadaimon (South Gate). 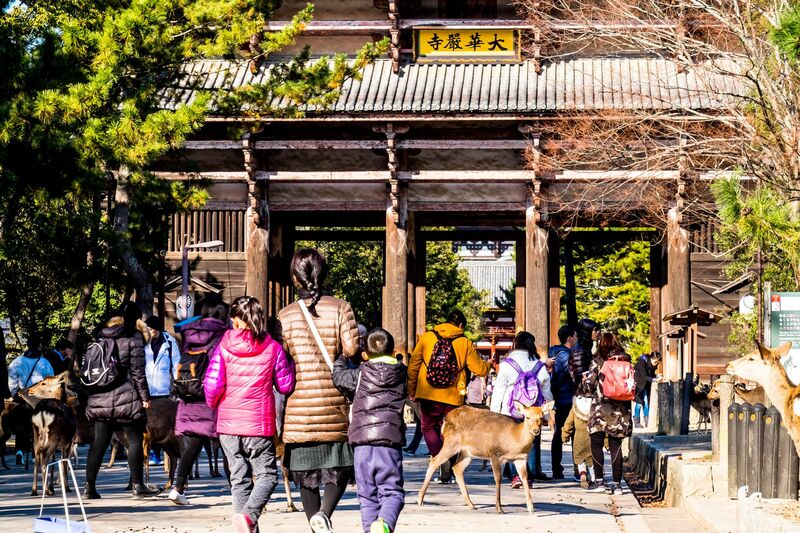 Step through this huge Japanese temple gate and enter the grounds of the Todai-ji. 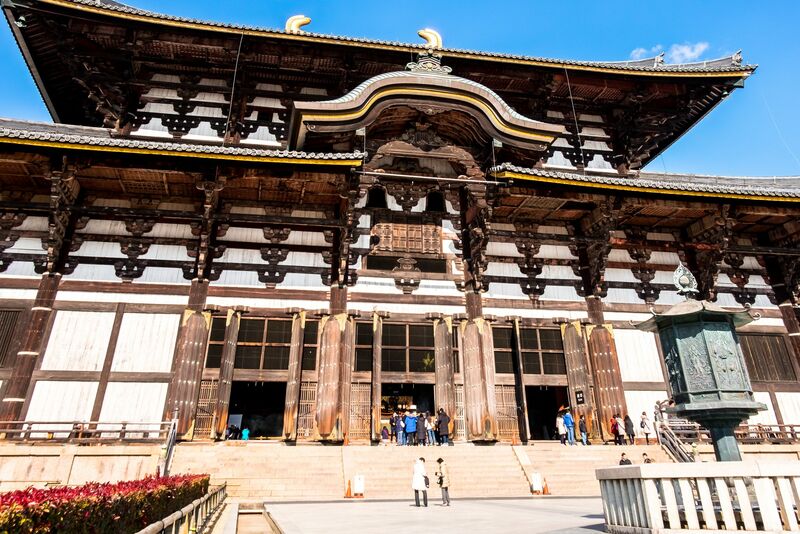 Todai-ji Temple is one of the largest wooden buildings in the world! 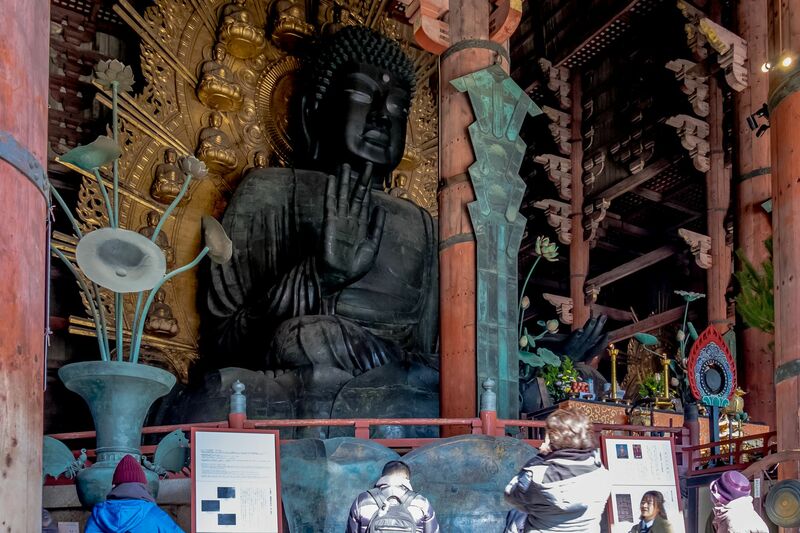 It houses the 15-meter high bronze Nara Daibutsu (giant Buddha), which also happens to be the largest bronze image in Japan. 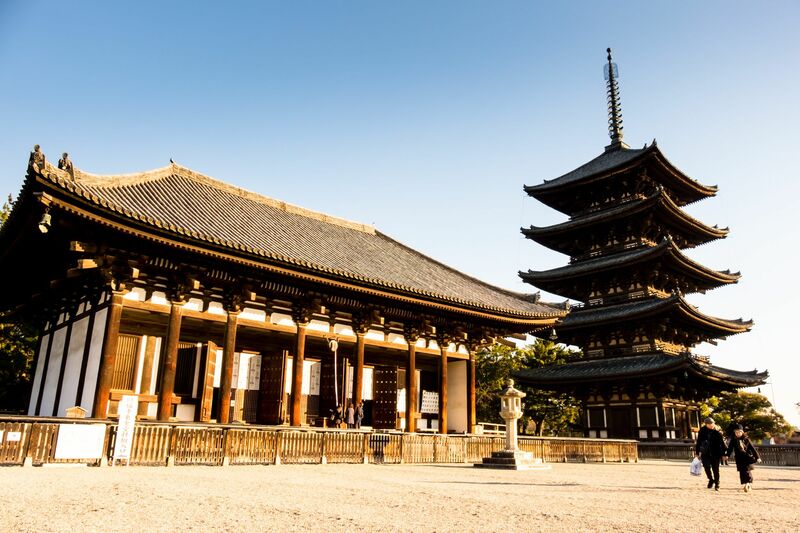 It is said that the temple's opening ceremony in 752 was attended by some 10,000 monks and 4,000 dancers to celebrate the completion of the Daibutsu. This statue weighs 500 tonnes! Take the time to explore around the hall of this temple. Within are various statues as well as a hole in the side of a pillar which is the size of one of the Daibutsu's nostrils. Legend has it that anyone who can pass through that hole will gain enlightenment in the next life! Enjoy a walk through the Kasugayama Primeval Forest, strolling pass rows of stone lanterns to reach the historic Kasuga Taisha Shrine. This is the shrine of the Fujiwara family. It was built in the 700's. It is famous for housing around 3,000 bronze lanterns. Thousands of these lanterns are lit up during special festivals in February and August. A short walk away are the temple grounds of the Kofuku-ji. The temple completed in 669 is famous for its ancient five-storey pagoda. The temple's Tokendo hall, located next to the pagada, houses a collection of ancient Buddhist statues. Nara is easily reacheable by train from neighbouring Osaka and Kyoto. It is an easy 40 minutes ride from Osaka's Namba station (Kintetsu-Nara Line) and about 1 hour from Kyoto (Kintetsu Line or JR Nara Line).